As a nonprofit organization, we rely on donations and the generous funding of our sponsors. It is with sponsor support that we are able to continue the daily and ongoing operating costs required to keep the Partnership running and effective. Everything from staffing and educational workshops, to maintaining our website resource registry, require the financial backing of our sponsors. Without the support, the Partnership would not be possible. As you consider your annual sponsorship budget, we want to make you aware of the opportunities with the Safeguard Iowa Partnership. We have sponsorship packages where each level offers a variety of benefits, visibility and more importantly, return on your investment. 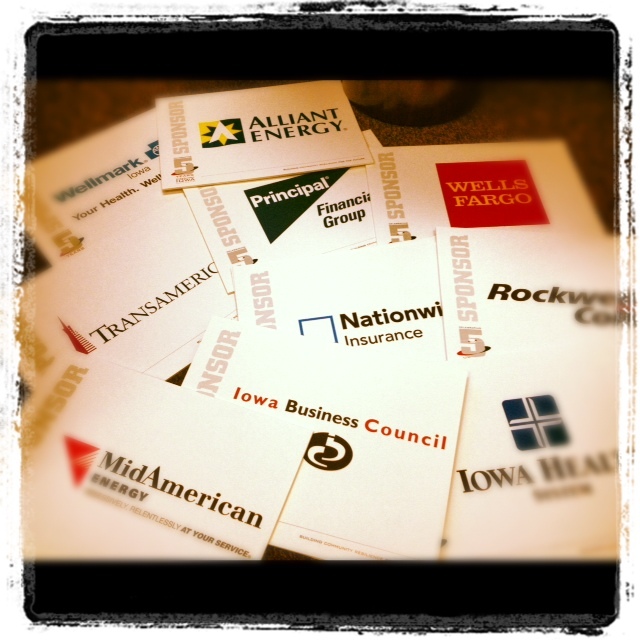 To learn more about becoming a sponsor, click here or contact Safeguard Iowa Partnership at 515.868.1795. Thanks to our current sponsors! The Homeland Security and Emergency Management Department (HSEMD) has been working to make Iowa more prepared for disasters since it began as the State Civil Defense Agency in 1965. The focus of emergency management and the hazards faced by Iowans may have changed in some ways since that time, but what hasn't changed is our commitment to making our state more prepared for any emergency or disaster. HSEMD mission is to lead, coordinate, and support homeland security and emergency management functions in order to establish sustainable communities and ensure economic opportunities for Iowa and its citizens. MidAmerican Energy Company, Iowa’s largest energy company, provides electric service to 732,000 customers and natural gas service to 714,000 customers in Iowa, Illinois, Nebraska and South Dakota. It is headquartered in Des Moines, Iowa. MidAmerican Energy is prepared to manage any incident that impacts service to our customers and works with local businesses, government officials and customers to help them prepare for and recover from significant events or disasters. Information about MidAmerican Energy is available on the company’s website and its Twitter, Facebook and YouTube pages, which can be accessed via www.midamericanenergy.com. Over the last 80 years, Nationwide has grown from a small mutual auto insurer owned by policyholders to one of the largest insurance and financial services companies in the world, with more than $135 billion in statutory assets. Nationwide focus is on domestic property and casualty insurance, life insurance and retirement savings, asset management and strategic investments. The Principal Financial Group® is a leading global investment manager offering businesses, individuals and institutional clients a wide range of financial products and services. Our range of products and services include retirement solutions, insurance, wellness programs, and investment and banking products through our diverse family of financial services companies and national network of financial professionals. Our corporate headquarters are located in Madison, Wisconsin. General offices are located in Cedar Rapids and Dubuque, Iowa; utility operation facilities are located in communities throughout our utility service territory in Iowa, Minnesota and Wisconsin. Our utility operations provide electricity and natural gas to more than 1.4 million customers in Iowa, Minnesota and Wisconsin. We currently have nearly 4,000 employees working across our service territory. Headquartered in Pella, Iowa, our company provides careers for about 8,600 valued team members. Our culture reflects our deep commitment to developing new technologies, increasing productivity, and practicing environmental stewardship. Pella Corporation was founded in 1925 as the Rolscreen Company. Initially, our company was most widely known for its "disappearing" Rolscreen window screen. In 1992 our company changes its name to Pella Corporation, to better reflect our entire product offering. Today, the Pella family of brands offers a full range of quality residential and commercial products for new construction, remodeling and replacement projects. We are particularly proud that we can offer our customers windows and doors to meet virtually any style or budget. In 1959, Founder Don Lamberti leased a store from his father on East 14th and Broadway in Des Moines, Iowa. After nine years of operating this old country store, which he remodeled into a convenience store, Don's gas supplier and friend Kurvin C. Fish, suggested that Don buy the Square Deal Oil Company. Wells Fargo & Company is a diversified financial services company providing banking, insurance, investments, mortgage, and consumer and commercial finance through more than 9,000 stores and 12,198 ATMs and the Internet across North America and internationally. We're headquartered in San Francisco, but we're decentralized so every local Wells Fargo store is a headquarters for satisfying all our customers' financial needs and helping them succeed financially. One in three households in America does business with Wells Fargo. Wells Fargo has $1.3 trillion in assets and more than 270,000 team members across our 80+ businesses. We rank fourth in assets and first in market value of our stock among our U.S. peers, and second in market value of our stock among financial service companies, as of March 31, 2012.